EAST HARLEM — Hundreds of people gathered Friday morning to remember Griselde Camacho, the tough but tender Hunter College campus police sargeant, who was killed in the massive blast that leveled two Park Avenue apartment buildings. Laying in a closed white casket with pictures from her life scrolling overhead, hundreds of City University officers and members of other law enforcement agencies paid homage to Camacho, 44, in her role as a mother, protector and person who's spirit uplifted whomever she was around. "She loved life and her smile was her trademark," said Camacho's cousin Nilsa Rios-Aguila at Bethel Gospel Assembly church at East 120th Street and Madison Avenue. Camacho, mother to a 14-year-old son, was one of eight people killed when what investigators believe was a natural gas explosion demolished two apartment buildings at 1644 and 1646 Park Avenue near East 116th Street. Camacho was on sick leave from her job at Hunter but her impact at the Silberman School of Public Health, which is located at Third Avenue and East 119th, was strong, said her supervisor Lt. James Edward Montgomery. When the Silberman School of Social Work at Hunter College first opened, some staff was nervous because they had never worked in Harlem and had misconceptions that the neighborhood was filled with nothing but "turmoil and crime," said Montgomery. Camacho's sunny disposition and quick laugh helped to make people feel more welcome at the site. "From day one the faculty and staff loved her," said Montgomery. "With her efforts, we made that place a better place," he added. Before starting work at Hunter in 2008, Camacho, who family called by her middle name "Ahidee," worked for 14 years as a police officer in Carolina, Puerto Rico. In 2012, she was promoted to sergeant, collecting awards and honors along the way, including the 2010 peace officer of the year from Local 237 of the Teamsters. Outside of work, Camacho spent time at her church, Bethel Gospel Assembly, where she volunteered as a member of the audio and visual ministry. James Darren Hicks, director of that ministry, said Camacho began changing things the minute she joined the group. She came in one Sunday and saw everyone drinking Starbucks coffee and was appalled. "She said: 'This is junk!' and she gave me Bustelo," said Hicks while pulling out a package of Café Bustelo, a Cuban style espresso with distinctive yellow and red packaging. The Sunday after her death, Hicks tried to make the Café Bustelo for the audio and visual team but just couldn't do it the way Camacho used to. "It was a mess. It overflowed, it was on the floor and the microwave started sparking," Hicks said during one of many lighthearted moments of the two hour service. Bishop Carlton T. Brown of Bethel Gospel Assembly gave Camacho's eulogy and reminded those present of how much Camacho loved her son and of her strong Christian faith, comparing her to John the Baptist, who died for his beliefs. "She was a mature woman willing to fight the right battle for the right reasons and to serve with nobility," said Brown. "Because she knew who she was, she was prepared to face death." 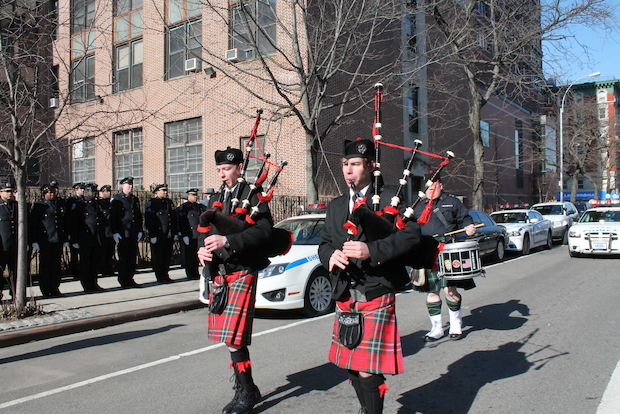 Camacho's casket was carried by an honor guard and accompanied with bag pipes. After her service, a procession, with police lights flashing slowly pulled away from the church. Gregory Crockett, 58, an entrepreneur and a member of Bethel Gospel Assembly who knew Camacho said he wasn't surprised that the church was filled to the rafters. "This was an outpouring of love that shows the immense impact that a single person can have," he said.